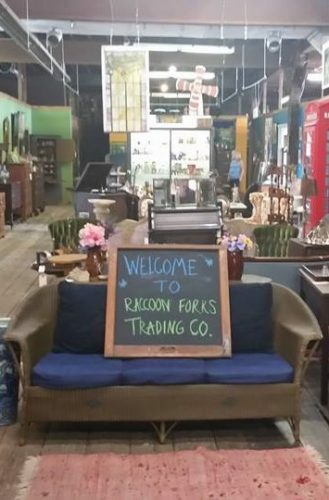 Raccoon Forks Trading Co., a real antique store specializing in antique and vintage furniture, primitives, prints and more, opened in 2011. We take great pride in our carefully curated inventory, which has gained the store a reputation as a must-see for antique aficionados and others looking for one-of-a-kind items. We've had a few different homes over the years, but have settled in for the long run at our current location in the northeast corner of the East Village. The building we now call home (and share with Railroad Bill's Dining Car) creates a unique experience for visiting history buffs, right down to original wood plank flooring and old-time sodas we sell. The building (c. 1920) was first occupied by the American Railway Express Company and still displays some of the building’s original and salient features. The building is undergoing a full historic façade rehabilitation project, scheduled for completion in late spring 2018. As a Raccoon Forks microbusiness, RFTC provides job opportunities to individuals with disabilities and other barriers to employment. Employees at RFTC receive one-on-one job coaching and the support they need to build skills and be successful on the job.